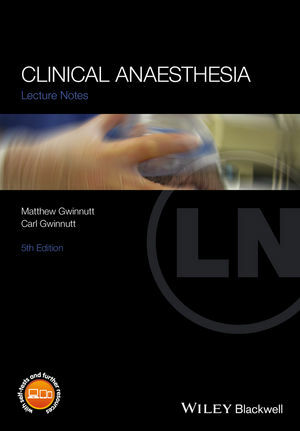 Full-colour diagrams, photographs, as well as learning objectives at the start of each chapter, support easy understanding of the knowledge and skills of anaesthesia, allowing confident transfer of information into clinical practice. Matthew Gwinnutt MB ChB (Hons) FRCA, Specialist Trainee in Anaesthesia, Health Education North West, Mersey School of Anaesthesia, UK. Carl Gwinnutt, MB BS MRCS LRCP FRCA, Emeritus Consultant, Salford Royal Hospitals NHS Foundation Trust, UK. "Anesthesiology can sometimes appear abstract to the undergraduate student, but Lecture Notes: Clinical Anesthesia would seem to be the bookto demystify the topic and engage this group of readers. This textbook is aimed at physicians' assistants and operating department practitioners in addition to medical students.